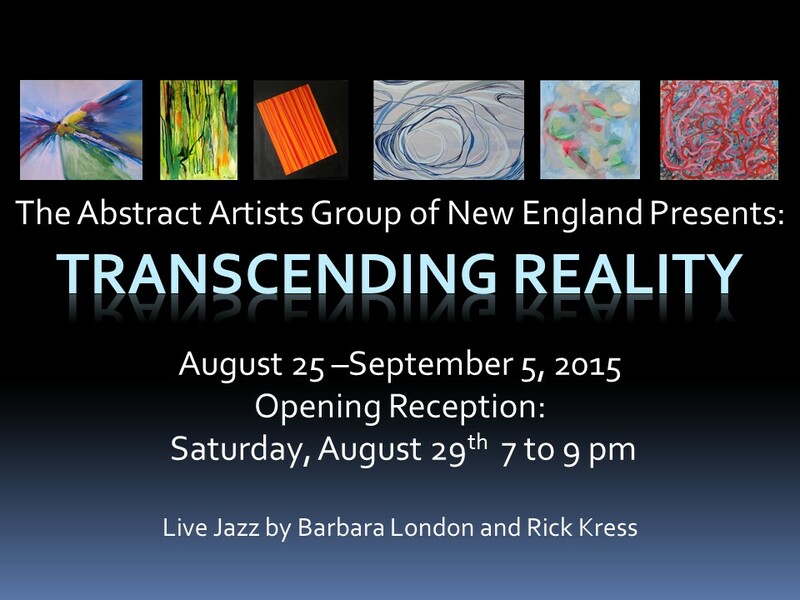 Last night, Saturday, August 29th, was the reception for “Transcending Reality”, the annual exhibit of the Abstract Artists’ Group of New England. It was a lovely reception – lots of conversation with both old friends and new acquaintances, live music by Barbara London and Rick Kress, lots of art to check out, fresh flowers as well as food & wine. This is our largest show ever, with over 150 individual works of art by 20 artists. 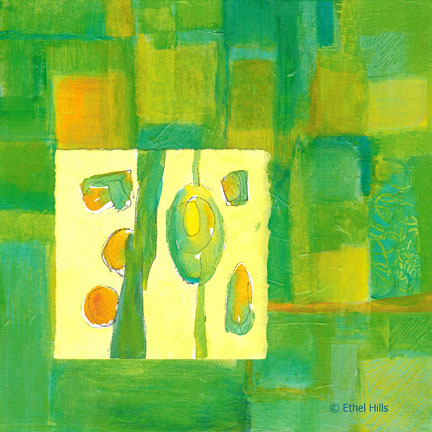 We even ended up with a small works wall containing lots of very affordable pieces of art 8” x 8” and even smaller. 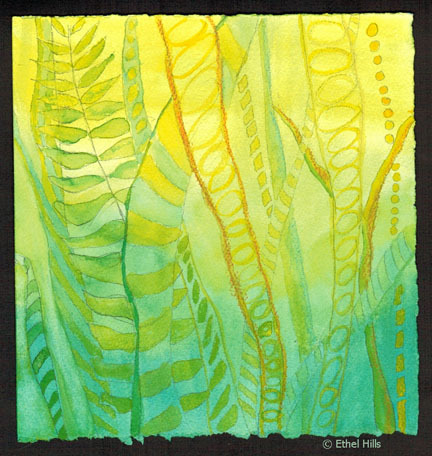 The exhibit will run through Saturday, September 5th at Newburyport Art Association, 56 Water Street, Newburyport, MA. I’m always extremely proud of this show. Although we are not a juried group and we don’t jury the individual work, I still think that our shows are amongst the most interesting and the strongest exhibits at Newburyport Art Association. You’ll find lots of color, lots of creativity, a variety of mediums and sizes. We have wooden sculpture, textile pieces, large oils, small oils, acrylics, collages, encaustic, mixed media, watercolor, pastels, and even mosaics. There are large pieces and small pieces and lots in between. And don’t forget to look for my mixed media collages while you’re there. If you go to the exhibit, please let me know what you think. Here’s one of the pieces that will go in the show today. This is a combination of a couple of things, a hybrid if you like. The underlying painting “Summer” was based on some of the initial sketches and notes I made for this project. And imposed on top is a little ink and watercolor drawing/painting/sketch. The ink and watercolor sketches were another attempt to get at the nature of this music. I think I did about 15 of them. I did the sketches in ink and then painted them with watercolor. At some point, it just seemed like combining the two made sense. In this case, my initial idea about the music become the background or border for another idea. I like this juxtaposition of ideas. It’s similar to what I’ve been doing for years, but it’s also different. It’s more combining two complete, yet different, ideas than just combining pieces to make a whole. I’m not sure if this is the beginning of a new series, but it’s certainly the beginning of some more exploration. On Sunday, we (AAGNE, Abstract Artists Group of New England) will hang our annual exhibit at Newburyport Art Association. I just got back from the studio where I’ve been busily finishing the last few pieces for this exhibit. More on this over the next week or so. I thought you might like a peek into this group of diverse artists. Barbara London took some snaps of artists and their artwork at our last meeting. We were all being a bit silly and it shows in some of the photos. We took down our exhibit last night. “Eye on Abstraction” was the annual exhibit for the Abstract Artists Group of New England. In some ways, I hate to see an exhibit come down, particularly a short one. Our annual exhibit at Newburyport Art Association is usually 2 weeks long and that never seems long enough to really have a proper exhibit and a proper celebration. That’s the other thing this exhibit is – a celebration of abstract art and a celebration of the artists who make it. The group started over 10 years ago by a small group of abstract and experimental artists who were feeling lonely and unsupported in a crowd of representational artists. We still have 3 of the original group and are going strong. This years exhibit featured 22 different artists and slightly over 100 pieces of art. A big thank you to all who came out to help us celebrate and those who decided to take a piece of art home with them. And a big thank you to this fabulous group of artists who regularly share their work, their inspiration and their advice. If you missed the exhibit, check out our Facebook Page for some shots of the exhibit.